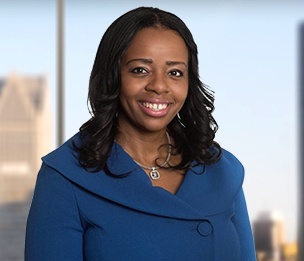 Ayanna C. Clinton is the Firm's Chief Human Resources Officer. Ayanna is responsible for providing leadership and direction of the firm-wide HR function. Areas of responsibility include employee relations, human resources policies and procedures, benefits and employee rewards programs, as well as administrative staff compensation, training and development, talent acquisition, diversity and inclusion, and related legal and regulatory compliance and risk management. Ms. Clinton brings over a decade of human resource experience with her to Dykema. Before joining the Firm, she formerly served as Chief Human Resources Officer of Tenet Healthcare’s Hahnemann University Hospital in Philadelphia, PA, where she was responsible for all human resources operations. Prior to her career in human resources, Ms. Clinton practiced as an attorney after earning her J.D. from The University of Texas at Austin. Ms. Clinton, a Detroit native, was honored by the Michigan Chronicle with a Women of Excellence Award in 2015.